Confession time: I am a huge Christmas nerd. This is not an exaggeration....I literally make myself wait until Thanksgiving day to start watching and listening to all things Christmas and, once that day arrives, all bets are off! I watch everything I can find Christmas related and will listen to Christmas music all day long in my office and on my commute. It drives my husband crazy but there you have it. With this being said, I was over the moon when I read about this book coming out and snapped it up as soon as I could. I am so glad I did because this was the absolute perfect book to read over my holiday break! Mr. Dickens and his Carol is a complete immersion into the world of Charles Dickens and his novels. Samantha Silva creates such a vivid world for those that love Dickens and his quintessential Christmas tale. Dickens is a frenetic, quirky, big-headed and big-hearted dandy who travels the many streets of London to not only calm his always racing mind and soul but to collect characters and worlds for his stories. All of the characters - not only Dickens but his befuddled publishers, his delightful children and wife, his kooky set of friends and colleagues, the plentiful and always interesting people of London - are brought to wonderful life. Even the streets of London themselves seem to take on a life of their own! It was so exciting getting a peek into this world filled with love, happiness, the lows of poverty and the highs of excess. And how the Dickens family loved their excess! To be honest, I think I would have really disliked Dickens given his need for all things if he wasn't so charitable and kind at the same time! I had no idea that A Christmas Carol was written as a demand - on an incredibly tight deadline to boot - by his publishers after his newest installment of Chuzzlewit was bombing. It was remarkable watching Dickens struggle to get this story written. With an incredible case of writer's block, those closest to him abandoning him or letting him down in various forms, and an ever-shortening timeline ticking away, Dickens has to face the ghosts - both good and bad - of his own past in order to find this story within himself. 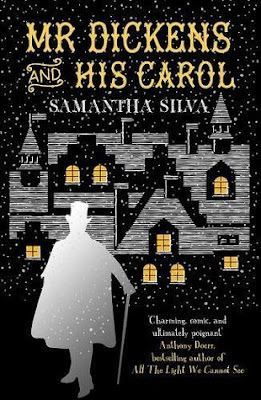 The way Samantha Silva writes the narrative I can't imagine Dickens being able to write the story any other way as so much of his own experiences and interactions are intertwined with his fictional characters. This adventure also brings him into contact with a literal ghost as well, one that helps him find his way back to his writing and, in turn, himself. Something else I found delightful was just how varied the emotions could be throughout the story. Dickens and his motley crew of family, friends, and associates give so much for the reader to giggle about mixed in with quite a few tender and sweet moments, as well as some pretty gut-wrenchingly sad ones as well. If you've got a soft spot for A Christmas Carol and the sort of world it inhabits your emotions will run the gamut when reading Mr. Dickens and his Carol. The book's author's note describes this story as a reimagining of how A Christmas Carol came to be, relying on real facts and people to lead the narrative. It's full of love, whimsy, heart, hope, and admiration for a man who changed so many of our views on Christmas and the spirit it evokes with his words. Highly recommended to anyone who lives for the spirit of Christas all year long as I do! This cover is absolutely gorgeous, even more so in person! I bought the UK edition from the Book Depository and nearly squealed with delight when it arrived. The images are printed directly onto the hardcover backing - no dust jacket - and for me this gives it a classic, treasured feeling. The yellowed light coming through the windows nearly glow and the sprinkling of snow gives it a beautiful wintery feel. Absolutely magical cover! I purchased a copy of Mr. Dickens and his Carol for my own library. All opinions are mine alone. To find more information about the book, including other reviews and links to where you can purchase your own copy, see Goodreads HERE. I'm a huge Christmas nerd too! Great review, Colleen! I cannot wait to pick up a copy of this. Thanks so much, Amy! Christmas dorks unite ;)! !